Laurie McBride was a leading advocate in California, pushing for statutory protections long before many activists considered doing so. She is a former legislative lobbyist who worked for decades in local, statewide and national movements for civil rights and political access for LGBTQ individuals. From 1990 to 1998, she was executive director of the Lobby for Individual Freedom and Equality, a state-wide coalition to advance gay rights across California. During this time she successfully led legislative efforts for employment protections, domestic partnerships, and HIV/AIDS treatment and prevention. She went on to work as a policy advisor and chief of staff in the legislature, and as Assistant Secretary of State. She also served as co-chair of National Stonewall Democrats for 10 years. 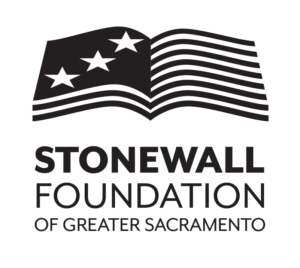 The scholarship was created by the Stonewall Foundation to cultivate advocates who, like McBride, understand that fighting for equality requires consensus building, commitment and resolve. CSUS McBride Scholarship applicants now have until Mar. 30 to apply! The Foundation selected Travis Legault as the 2018 recipient of its McBride scholarship. 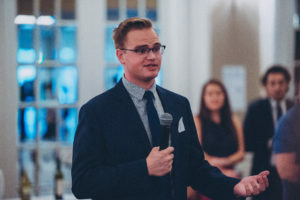 Travis has been involved in student government at Sac State as board member of the California State Student Association and legislative affairs coordinator for Associated Students, Inc. Within these roles he has worked to put a stop to bullying in K-12 schools with the help of Equality California, where he was a recent legislative fellow. As Travis describes, his commitment to advocacy and leadership is clear. In 2017, the Foundation selected Vrindavani Avila as the first recipient of the Laurie McBride scholarship. Avila (they, them, theirs) is a senior, majoring in women and ethnic studies. They work with the CSUS Women’s Resource, Multi-Cultural and Pride Centers, helping develop and facilitate workshops on social justice issues. As a queer Latinx woman of color, much of their work focuses on autonomous full spectrum reproductive health education, centering on experiences of the LGBTQ community and using gender inclusive language. Their research centers on decolonizing gender and sexuality with concentration on the imposition of patriarchy, heterosexuality, and the gender binary on indigenous peoples and other communities of color. Avila also educates students on the importance of being an active bystander to incidences of violence and providing resources on preventing sexual violence. Goals include: 1) completing a Master’s Degree; 2) educating outside and within academia on issues facing queer people of color; 3) helping establish community services that support people of color. "Receiving the McBride scholarship was a completely unexpected surprise. I have been doing social justice work for communities of color and the LGTBQIA community for over five years, and the work is powered by the love I have for my communities and driven by a critical consciousness towards liberation for all queer transgender people of color. 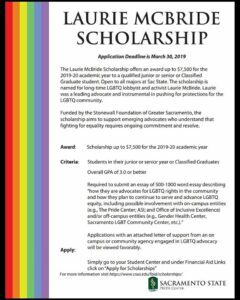 Winning this scholarship reminded me of all the struggles that trans women of color have done and are continuously doing for LGTBQIA youth and folks in order to survive today with some rights and privileges. Without trans women of color like Sylvia Rivera, Marsha P Johnson, and the current work of Miss Major Griffin-Gracy, there wouldn’t be a LGBTQIA movement; without their dedication to liberation, their work fighting against racism, prisons, and poverty has brought the whole community closer to a place of freedom. Without the work of trans women of color and gender non-conforming folks, I wouldn’t have been able to receive this scholarship recognizing the work I have done and continue to do. 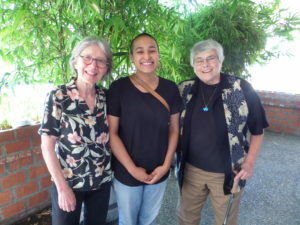 I am grateful to receive the Laurie McBride Scholarship as it is a reminder of why doing this work is necessary and crucial, and there is still a lot of work that needs to be done to ensure equity and liberation for all queer folks of color."